This yoga pilgrimage journey to Nepal will begin at the Vajra Hotel in the area called Swayambhu, ten minutes walk from the Swayambhu stupa in Kathmandu. In this beautiful oasis, surrounded by trees and with big views overlooking the Kathmandu Valley, is where our sessions of mediation and Buddhist philosophy will take place. After having settled into Kathmandu for the first few days, we spend the following week in the hills of the Kathmandu Valley. We spend three nights at Neydo Monastery in the sacred valley of Pharping. After our stay there, we journey onward to Namo Buddha where we stay three nights at the beautiful Namo Buddha Resort. On our way back to Kathmandu, we pay homage to the majestic Boudha Stupa. We spend the last night at Vajra Hotel before we travel into the foothills of the Himalayas on the next day. We fly into the town of Phablu, in the lower Everest region, which is our starting point. From here, we begin our hike through the upper valleys of Chiwang and Ringmo until we reach the nunnery of Thubten Choling on a hill, nestled into pine tree forests and prayer flags. Here we spend a full day, taking part in the lives of the nuns, before making a loop back to Phablu during our 5-day hike. If weather permits, we will get a glimpse of the majestic Himalayas from Phablu. We return to Kathmandu by flight or jeep the following day, where we will have our last night of the pilgrimage journey back at Vajra Hotel. The yoga, Buddhist philosophy and meditation theme will be weaved into our days, both in Kathmandu and in the mountains, as we embark on an inner and outer journey through Nepal. This yoga pilgrimage will be jointly facilitated by yoga instructor Joan Hyman, and instructor in meditation and Tibetan Buddhist philosophy, as well as the guide in Nepal, Sisse Budolfsen. The groups will hold the maximum amount of 15 people. 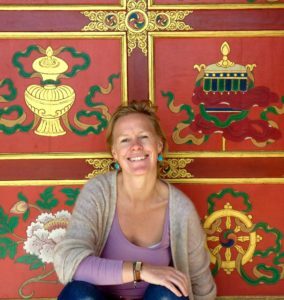 Sisse Budolfsen has been based in Nepal on and off for nearly 12 years and has a wealth of experience in Nepal, Tibet and in the Himalayan region. Sisse has studied and practiced Buddhist philosophy and meditation practice throughout her time in Nepal, and Sisse guides and facilitates the meditation and philosophy sessions during this Yoga Pilgrimage. For more information on Sisse Budolfsen, please go here. – We are very excited to be facilitating this yoga pilgrimage together for the first time! The Buddhist culture of the Himalayas, with the countless blessings of the many yogis and yoginis who have practiced the path of awakening here for centuries, seep out of every temple and shrine in the Kathmandu Valley. In the daily meditation sessions, we will explore the inner capacity for the mind to fully rest, and familiarise ourselves with the experience of being free from the constant, and very subtle dichotomy of hope and fear. We start the day by exploring the inner experience of awakening in ourselves, as well as grounding our awareness into the body through yoga, and in the afternoon sessions we enhance the experience by becoming pilgrims and yogis. We explore the outer element of sacredness and the culture of awakening by visiting, and paying homage to the many sacred temples and shrines in the Kathmandu Valley. In the evenings after returning home, we salute the day through unwinding evening yoga. There is no prerequisite for joining the yoga pilgrimage, or to have in-depth knowledge or experience with the practice of meditation. Simply, to have the wish to go deeper with one’s mind, and to have curiosity regarding its functions is enough. There is nothing religious about the practice of meditation, or to visit sacred places and shrines. In fact, there is nothing even Buddhist about it. The practice of meditation is simply a tool to bring your mind back to a place of naked awareness, to a place of basic space with yourself. In fact, it is simply put a technique with which to uncover all the layers of hope and fear, grasping and expectations that are all such strong habits of the mind. With the practice of meditation we can learn to come back to ourselves, and to become familiar with the groundless and raw quality of reality. The yoga sessions will combine carefully sequenced including a different theme each day. Classes will range from a vigorous morning practice including pranayama and meditation and a more gentle restorative practice in the afternoon. Detailed alignment, exploration of anatomy, sensory awareness and mindfulness is emphasized to encourage deep listening and a compassionate understanding of one’s own mind-body with the overall intent of cultivating prajna (insight and wisdom) within the yoga experience and beyond. The sessions are suitable for all levels including those those new to yoga, and modifications of poses and props will be used as needed.